You may have heard of the famous Extreme Super Saver Combos! Book both a Dolphin Swim Adventure and a Wild Canyon Zip Lines tour and save 25% off Hotel Prices! You save up to $80.00 per person! To book this super saver combo, just click "Book It"! Ride Cabo's most exciting Monster zip lines, and then cool off by swimming with real live dolphins! Do the tours both in the same day, or do them on different days, it's your choice. 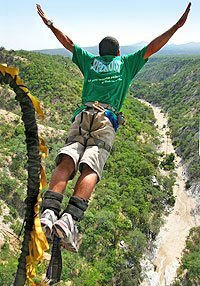 If you like, you can opt to do an adrenaline-charged Bungee Jump or Extreme Sling Swing instead of the Canopy Tour, or family oriented Camel Quest, same price! One of the best deals in Cabo. Cruise Passengers: Yes! This tour makes a great shore excursion. There's a special schedule just for you! Runs: Adventure Park activities run two times daily at 9:00 AM and 12:00 PM. There is also a 10:30 AM pick-up for cruise passengers. Dolphin Swim Adventure runs four times daily at 9:00 AM, 11:00 AM, 1:00 PM and 3:30 PM. Duration: Adventure Park activities last about 3.5 hours. Dolphin Swim Adventure lasts about 1 hour. Per Person. Includes Zip Lines & Dolphin Swim Adventure. You can switch Bungee Jump, Camel Quest or Sling Swing for the Zip Lines if you wish.